Put the kids to bed and plan an evening of looking back at photos and videos of your time together. You can watch your wedding video, family home movies or pull out the old photo albums. This will rekindle the bond that made you two fall in love and allows you to remember all of the good moments. Pick your spouse up from work by surprise and head out to the movies or a favorite restaurant to enjoy dinner and a movie out. With the busy life everyone lives, it’s great to have a little surprise on Valentine’s Day for a date night out together. Cook up a good meal and package it tight. Keep it in a container that will ensure your meal stays warm, get a babysitter and hit the road with your spouse. Go to an amazing local view, sit in your car and enjoy a meal on the road. If you and your spouse enjoy crafting things up, why not spend your Valentine’s Day date night doing something creative together. Come up with some ideas that each of you can make to surprise the other with a gift and enjoy the time together, relax over a craft making session. Whatever you decide to do for your Valentine’s Day date night idea, it’s important that you both remain committed to not speaking about kids, adult responsibilities and anything that could cause stress. This evening should be all about celebrating the love you two have for each other without anything else getting in the way. We are so overdue for a date night. We have completely opposite schedules so it’s nearly impossible. Another fun thing to do for us is to walk through a home improvement store and just imagine and talk. What fun ideas! We generally go out for lunch on Valentine’s Day if my husband can get it off work. It’s less busy then! We’re boring people. I would love a surprise date! Our kids are always in tow anywhere we go or whatever we do but if we will be given a chance to be together without the kids, it would be awesome! These are all fun ideas. We tend to stay in and have a romantic dinner at home. Taking a trip down memory lane sounds like fun! Surprises are always fun so I like the idea of a surprise date. I am quite crafty so maybe I can show my hubby a thing or two on the DIY side! I wonder if I can convince my husband that a museum would be a fun date for V-Day?! I absolutely love the idea and I hope he will too. I like the idea of doing a craft together. My husband has mentioned that he would like to do glass blowing maybe this year we can do that for Valentines. Totally agree that Valentines Day doesn’t have to over the top expensive. Like all your different ideas. Being together is what it is all about. 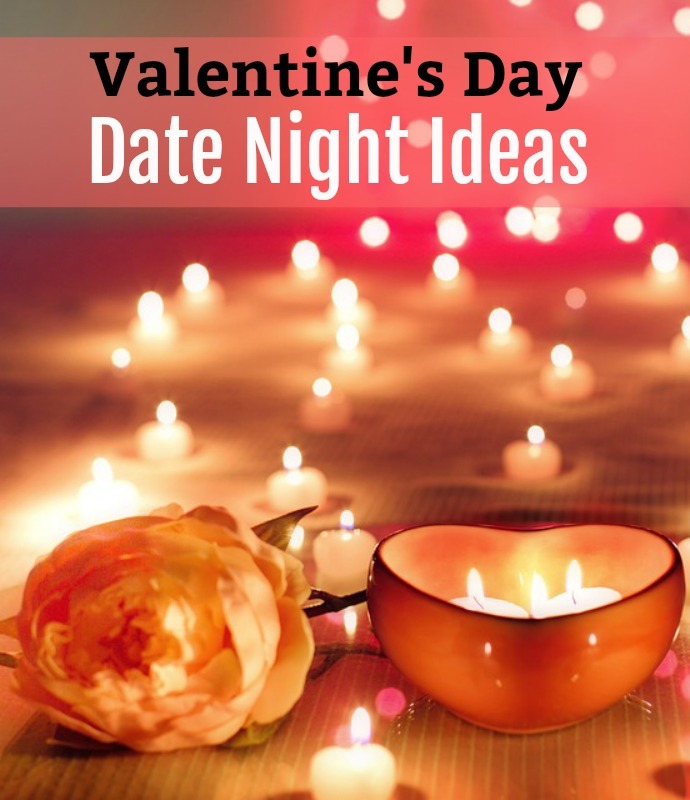 These are all fun date night ideas. I like the dinner on the road idea. We’d definitely have to eat in the car since it’s frigid here in February, but there are some great views around here. Great ideas – I’ve never understood why people think they have to go all out on this one day. I would rather my husband give me flowers as a surprise – which he does – than spend a small fortune on this day. Valentines Day falls on Art Week in my city so it’s one of the few times hubby will join me for the monthly art stroll. Dinner is his choice, art night is my choice and it makes for the perfect Valentines Day date. Dinner on the road is such a cute idea!! I love the idea of going to a local lookout and just spending a romantic evening together. We’ve never really been a couple that celebrated valentines day. And then with each kid, the less and less we even paid it any attention. Half the time I don’t even realize it is here. These are some great ideas though. These are some lovely ideas, I like the idea of taking a trip down memory lane, we all make some amazing memories over time and perhaps don’t always take the time to reminisce as much as we could. I love the meal on the road idea. These are some creative ways to spend Valentine’s Day. So many great ideas! Love the idea of taking a trip down memory lane! These are all fabulous ideas. I would love to take hubby on a surprise date. My husband and I were just talking about Valentine’s Day. These are great ideas! These are some amazing ideas. I have my night all planned out. Great ideas! I have no clue what we’ll be doing. Guess hubby better plan something good for us. I”ll have to direct him to your post. These are really great ideas! I’m still planning our Valentine’s Day date and I might consider these! Thanks! A dinner on the road Valentine’s date sounds lovely, if the weather permits. I would probably reserve that for our wedding anniversary instead. This year, I think a trip down memory lane themed Valentine’s day date would be nice! These are great tips and I never thought about going cultural. I’ve tried being crafty but that usually doesn’t go very well lol. These are great Valentine’s Day ideas! We did the trip down memory lane and I loved it. I love the Get Cultural idea. We love museums and art. Love all your ideas! Can’t wait to use some of them or ALL!! !